An example of the illuminated manuscript.Bangor University and the National Library of Wales, Aberystwyth, have collaborated on a project to bring one of the jewels of English literature, kept at the National Library, freely available to all. The Hengwrt copy of Geoffrey Chaucer’s Canterbury Tales, produced in London at the close of the fourteenth century and believed to be the earliest existing version of this work, is now fully digitised, and accessible by global users via the Library’s website. The publication of the digital images coincides with a season of events at the National Library celebrating Chaucer’s work. Dr Sue Niebrzydowski (School of English, Bangor) has curated a special exhibition at the Library in which visitors can see the original Hengwrt copy of the tales alongside other rare Chaucerian items. 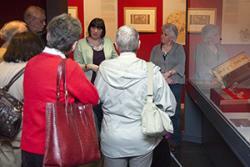 She has also taken visitors on ‘gallery tours’ guiding them through the exhibition and given a well-attended public lecture at the National Library on the importance of the Hengwrt Canterbury Tales. Under the auspices of IMEMS (the Institute for Medieval and Early Modern Studies, Bangor and Aberystwyth Universities), Dr Niebrzydowski hosted and organised a conference, held at the National Library (14-16 April, 2014), re-examining Chaucer’s work and the role of Chaucerian manuscripts across time, that attracted an international body of scholars and students. In addition, Bangor University and the National Library of Wales jointly sponsored two M.A. students to assist the work of the project under the ‘Access to Masters’ scheme; Kieran Homer and Becki Moss both worked on the educational aspects of the exhibition. As a result, the project was able to incorporate outreach to local schools, and Dr Niebrzydowski gave several workshop sessions on The Wife of Bath’s Tale for A-Level students. The free, public exhibition in the Hengwrt Gallery at the National Library of Wales, ‘Dweud stori: Chaucer a Chwedlau Caergaint/ To tell a story: Chaucer and the Canterbury Tales’, runs until 14 June, 2014. The Hengwrt copy of The Canterbury Tales can be viewed here.